When it comes to art, there’s usually no right answer. When it comes to displaying art, however, there are some tried and true principles that can mean the difference between showing off a sculpture and showing off your ignorance of sculpture. 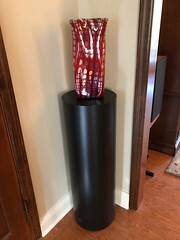 A few posts ago, we shared some tools for designing a pedestal for your piece at home. We decided to zoom out a little further and talk to the experts—curators and exhibit designers from some of our favorite galleries and museums—to find out more about displaying art at a pro level. Whether you’re curating an art gallery or just looking to up your game when it comes to interior design, give this a read first. Ask yourself, what story do I want to tell? 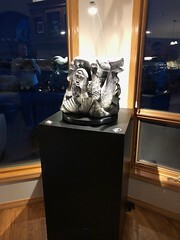 According to Hatchadoorian, in purely art exhibitions (as opposed to history or interactive exhibition) you want to use lighting to highlight the artwork to its fullest without calling attention to the lighting itself. The lighting has to be subtle and unassuming and vibrant, all at the same time. You have to make sure everything is smooth, no dark spots or hot spots on the work or the walls, no reflections, no halos, nothing that can distract from the work. 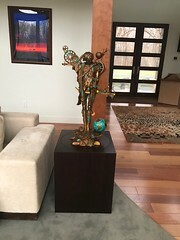 Often times the artist knows how their piece is best displayed and may have thoughts (or in some cases, requirements) for how best to display their artwork. They’ve spent more time than anyone looking at their piece and should be considered the expert when it comes to making big decisions about how it should look. Sage Sommer, the exhibition manager and registrar for SITE Sante Fe, always starts by collaborating with the artist and/or lender to come up with an art display solution that both fits the space and stays true to the vision of the artist. 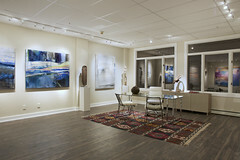 If you don’t maintain your art display furniture and gallery, it can set the tone for the art itself. 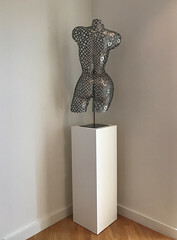 According to Sommer, a dirty, worn out or otherwise unkempt pedestal detracts from the piece it holds and can be very distracting for the viewer. When you have multiple pieces to display, it’s best to have a standard pedestal option that you try and stick to whenever possible. 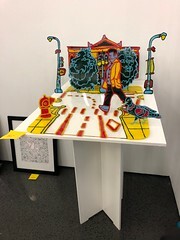 Dave Kerber of Taglialatella Galleries said that they use a uniform size and color (white) to keep the bases from standing out or becoming a distraction from the art itself. Before ordering 18 new art display pedestals for a new exhibit or collection, know and understand the practical limitations of your space. Kerber said that at Taglialatella, their standard pedestals are all collapsible so that they can be easily stored in their limited space when not in use. At the end of the day, it’s all about feel and the proper height and footprint are crucial. 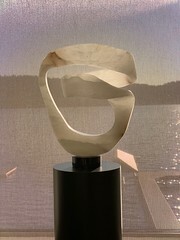 Too large a pedestal and the artwork will disappear, too small and safety becomes an issue. Generally speaking, you want a footprint at least 1.5″ larger than the base of the artwork itself, though this gets complicated when adding a turntable or lighting. 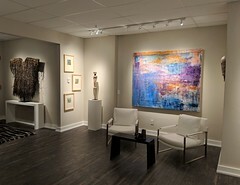 We’ve consulted on tens of thousands of art displays over the past decade, so give us a call. We can’t wait to talk about your art display! Hatchadoorian summed up the advice in one simple sentence: Let the art do the talking, and get out of the way. Designers agree: in the world of furniture, the cube is both an eye-catching yet pleasantly familiar shape, and has the additional super power of saving space—one of the many reasons it is a favorite among Japanese designers, who often work within the confines of dense, urban environments. Our cube tables are useful in both residential and commercial spaces as functional furniture with a growing variety of uses. We’ve collected a few of our favorites to inspire you for whatever your decor project may entail. Shape-shifting coffee tables. Rather than one large, immovable table, putting a few of these smaller cube tables together creates a dynamic space that can easily be manipulated for different activities and functions. Push them together for a board game, pull one aside for the perfect mug stand or scoot one closer to the couch as a footrest. 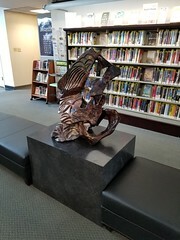 Sculpture display stand. Elevate your favorite piece or vary the height of your collection to add interest and depth to any display. Plant stand. Bring the outdoors inside this winter with a cube table plant stand—try using one to create a more stunning feature with a taller plant, or as a coffee or side table stand for your succulent collection. Side table. The perfect size to sit in that corner between your sofas, next to the chairs in the waiting area or beside your bed. 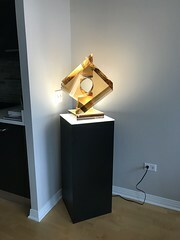 Lamp stand. Lighting is everything. Don’t let an inconvenient space keep you from getting the light right. Our cube tables come in every finish and are fully-customizable. Order today to get yours in time for the holidays. Whether planning a fundraiser, office Christmas party, networking event or wedding, there are some tried and true methods for ensuring your guests leave happy, and you leave having met your goals. We spoke with 5 event experts about their keys to event success—you may be surprised at what they had to say. Define a clear call to action and measure your success. Do you want your guests to donate? Join the organization? Host an event themselves? Engage in some other way? Define what would make your event successful and come up with a way to measure it. Madisen Golden, Resource Development Manager for United Way Larimer County, suggested comparing the number of attendees to the number of attendees that converted. Know your audience. According to Mary Douglas, partner at Corinthian Events in Boston, understanding your ideal attendee influences all other planning. For instance, if you’re inviting world-traveling luxury foodies, skimping on the refreshments may not be a good idea. If you’re hosting a networking event, you don’t want the hired entertainment to be so loud or distracting that people can’t easily mingle. Know who’s coming and plan the event accordingly. Do your event research. Mary said that understanding the history of the event can help you avoid previous pitfalls and/or prevent new ones. Talk to people who attended in previous years and find out what worked and what didn’t. Was the location too cramped? Did people leave early because it was just too long? Change what didn’t work and stick to what did. Organize a killer team. Between your speakers, venue, food, marketing, etc., no single person can do it all (at least not well). According to Wild Apricot, the most successful events have a single event manager as well as a team of individual chairpersons to head up each subcommittee. Just like mom’s house, everything revolves around the kitchen. Food and beverage have the power to make or break an event, according to Lindsey Dienstbach, owner of Bello and Blue Events. It doesn’t have to be elaborate but should be well thought out. Lindsey recommends having a variety and taking into consideration how people access it to avoid bottlenecking or long lines forming. Don’t forget decor. You don’t have to break the bank to make a space look festive, match a theme or evoke a feeling. We’ve worked with hundreds of event planners on a range of budgets to come up with the perfect event display, event furniture, flower stands and bars to set the stage for event success. Don’t be ready on time. Be ready early. Regardless of start time, there will be attendees that arrive early. It’s just a fact of life. With that in mind, Madisen recommends having everything ready 45 minutes ahead of time so you can be relaxed and poised for the publish when the early birds start to show. The old adage is actually true this time: Communication is key. Every event planner we spoke with for this article agreed that this should be happening before, during and even after the event. The more engaged, directed and informed your audience feels, the more likely they are to have a positive experience which will translate to positive feelings towards your business or organization. Consider starting a Twitter feed, Facebook page or other social channel for disseminating all relevant information to guests. Answer the question “What’s next?” Your audience may be moved, inspired, excited or energized after your event—make sure you put the momentum to good use by letting them know what they can expect next, whether that be a future event or a way to keep the conversation going online. When Lt Col Adam Bingham took command of the 14th Airlift Squadron in Charleston, SC, the state of the building he inherited did not live up to the historically incredibly high standards of the squadron. Besides the general maintenance and cleaning that needed to be dealt with, it was missing any representation of Pappy the Pelican, the squadron’s mascot since its activation in 1940. Bingham had seen a story published in the Pensacola, FL newspaper about a city-wide art project to decorate pelican statues—statues that looked like the perfect representation of Pappy. He’d been trying to get his hands on one for the base for several years before finally deciding to call the city’s chamber of commerce to see if they had any idea where he could get one. Strangely enough, one of the pelicans had popped up on Craigslist just a few days earlier. It was meant to be. Bingham purchased the sculpture and had it painted with the blue and gold of the 14th and a reference to their motto on the wings. It looked great—too great to live outside in Charleston’s predictably volatile weather. So Bingham called us. He spoke to Steven Kroll, one of our customer care specialists and pedestal design experts and was straightforward with what he wanted. Bingham provided Steven with a few dimensions, and that was it. With the help of Brad, our lead design engineer, Kroll put together a custom cylinder pedestal finished in a shimmering black brushed aluminum with a motorized turntable and eight corner lights, giving the pelican an elegant glow visible from 360 degrees. The result was over and above Bingham’s expectations. 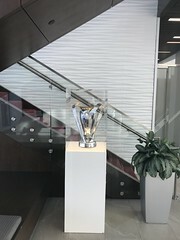 The sculpture is now prominently displayed on their main floor, where every Airman, every visitor, every single person that walks through the building, can’t help but see it. The pelican and inscribed pedestal most certainly elevated the look and ambiance of the building, but they did something else, too. For the squadron, the pelican represents its heritage, history, camaraderie, the brotherhood and sisterhood of people willing to go to war together. For Bingham, the squadron is an extended family, and Pappy the Pelican represents their unity. This constant reminder of who they are is one of the ways Bingham has helped to build a winning culture. You just got home from that amazing trip to [insert fancy European city here], where you finally found that perfect piece for your home or office place. Now the question is, how will you display it? Ask any museum curator or gallery owner and they’ll tell you that how you display a work of art is absolutely crucial—it’s directly related to a viewer’s overall appreciation of the piece. Oftentimes the difference between a few inches to the left or a laminate vs. acrylic finish on the display structure can make the difference between a perfect and a second-rate presentation. At Xylem Design/Pedestal Source, we ask our customers four questions to help them design the ideal display, and we’ve found that those who thoughtfully think through these steps are the happiest with the final product. While there are endless custom options, these are the four basic design components that need to be accounted for. Most pedestals come in three basic shapes: circular, square, or rectangular. Wendy, one of our customer care representatives who walks through this process with art collectors multiple times a day, thinks the best way to compare options is to see them for yourself. Wendy’s pro tip: Cut out the different shapes from newspaper or cardboard to help visualize how each might look under your piece. If you’re still not sure, try browsing through our photo gallery to see what you like/don’t like, and whether you can find a similar piece for comparison. If you decide to design your pedestal with us, we’re always happy to get on the gemba cam to help you visualize the options. At Xylem, we offer a wide variety of materials to choose from, including laminate, acrylic, wood veneer and metal. Each one has its own look and feel. If you’ve got the time, we highly recommend ordering a sample of whatever material you’re considering to see how it looks with your piece and in the location where you plan to display it—wall color, furniture and decor all make a difference. Image courtesy of Briana Arlene Photography. There are two aspects of display size to consider: height and footprint. When considering height, we recommend experimenting with different measurements in the room by placing painting tape on the wall where your sculpture would hit with different display sizes. This can help you visualize how it will look in relation to other objects in the room and to the ceiling. Trinity Wilbourn, co-founder of the home staging firm Trove Collective, suggests varying heights in a room to add interest and depth. So making sure your sculpture isn’t on an even plane with a couch or table will help it stand out. 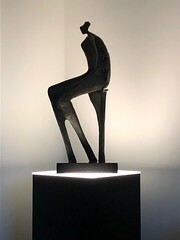 When it comes to lighting, it’s crucial to know where you plan to display the sculpture. Indoor vs. outdoor, ceiling height, the direction the windows face, etc. all have their unique implications. Lighting can also have a huge effect on the mood and feel of a piece. For example, one of Wendy’s customers was sure she wanted lower corner lighting on her Madonna statue, but when she tested it out, she realized it gave the piece an ominous feel. In contrast, the ambient lighting tends to have a warming, comforting effect. We offer a variety of lighting and accessory options, and it can be overwhelming to choose. To help with analysis paralysis, one of Wendy’s pro tips is to use a flashlight to experiment with different directional light at different times of day to see which one you like best. We’re always happy to walk our customers through this process over the phone or on the Gemba cam, but some of these decisions will come down to preference. The most important thing is that you take the time to “do your homework”—take the time to consider the options available to you. After all, you went through all the work of purchasing the piece and bringing it home—it’s important the display does it justice. If you’ve ever walked past an UGG window display, you may have noticed that it’s not their product that first causes you to stop and stare. It’s the feeling it evokes and the beginning of a story it’s telling that turns eyes and draws you into the store. We’ve worked with UGG on seasonal window displays and never cease to be impressed by their vision, dedication to detail and innovative design—making them one of the most recognizable brands today. UGG’s visual presentation coordinator, Ryan Larson, recently shared a little more with us about their display design process, why it’s so important to them, and how it builds their brand. Start with a message, not a sale. Ryan said he and his team start by telling a story that embodies the UGG lifestyle, rather than pushing the product first. They’ll incorporate new and/or seasonal merchandise into the design, but focus on displaying the brand’s “life force.” Be it adventure or luxury, edgy or classic, comforting and familiar or sleek and modern, it pays to know who your brand is and what it’s about, and then build your displays around that story. Keep it consistent. If you’re like UGG and have displays around the country, it may be tempting to adapt to the culture of each location, but that can actually hurt your brand recognition. UGG keeps their storefront displays consistent across the country, so if you see a pair of boots displayed while on vacation in Hawaii, you’ll see the same scene when you return home to NYC (and be more likely to buy them, according to the marketing rule of 7). Explore new inspirations. Last year, Ryan and the team were launching their new glitter sneakers and wanted to expand on the glitter theme in their product launch window displays. So they went to Global Shop with a plan to look for all things glitter, and there they discovered a company that made fabulous glitter walls. They ended up hiring them to build their walls in custom dimensions and sizes for each store. The displays brilliantly reflected the new collection while staying true to the UGG brand. Q3 and Q4 are where it’s at. Everyone in retail knows that the second half of the year holds the highest potential for sales. UGG plans their displays accordingly, allocating more time and resources when potential ROI is much higher. Be choosy with your vendors. Despite planning displays up to a year in advance, designs can evolve, budgets change, and issues may arise that lead to tight turnaround times. So when Ryan finds a vendor like Xylem Design that can keep up with their pace, they hold onto them. It’s also important to UGG that vendors can stick to their quotes, even if there are minor adaptations to the design, as it helps keep the process moving without having to put things on hold for a new budget approval. And movement is life. Let us help you step up your game (and increase your sales) with your next store display. Call us today for a custom quote. It can be tempting to get googly eyed over the number of attendees a trade show organizer boasts, but if none of them are coming to your booth, you might as well have set up shop at the county fair in Muleshoe, Texas. Whether you’re out for leads, sales, or simply brand awareness, a nice sign or even a booth babe (this is a real thing) are no longer enough to attract your ideal customer. Your tradeshow booth marketing needs to start long before the show opens, as part of your larger marketing machine in order to get the most bang for your tradeshow buck. We’ve consulted industry experts and come up with the top 7 ways to ensure the highest ROI possible at your events this fall. Set your goals before the show. Susan Friedman, a trade show marketing expert and industry consultant who goes by “The Tradeshow Coach,” said that before you spend a dime on marketing, you need to ask yourself why you’re going to the show and what you want to get out of it. Do you want leads? Are you trying to close sales? Building brand awareness? These will inform many of the decisions you need to make around marketing material, giveaways, booth design, etc. Choose your booth staff wisely. Quality booth staff is key. People are, first and foremost, interested and attracted to other people, and if your staff looks like they’d rather be somewhere else, so will your customers. Friedman said to staff your booth with people who are knowledgeable about your product or service, engaging, and interested. Remember, the most interesting people are always interested. Most tradeshows have a featured #hashtag you can utilize to let attendees know who you are, where you’re at, and what great things they can find at your booth. Colleen Canty, trade show coordinator for Bulb, saw a huge increase in booth traffic when they decided to stay active on Twitter, Facebook and Instagram while exhibiting. This is also a great way to engage your current followers and fans who may be attending the show. The experts agree, when you try to attract everyone, you attract no one. By now, you know your customer, their habits, likes and dislikes. Build your booth and marketing strategy around your ideal customer. The Tradeshow Network Marketing Group recommends building your exhibit and all your collateral materials around the niche you’ve identified to be the most important at each particular trade show (this may be different depending on what show you’re attending). Whether you want your booth to be loud and exciting with lighted displays and brilliant colors or peaceful and calming with comfy seating and an organic ambiance completely depends on what your ideal customer wants. Build it for them. Don’t be afraid of technology. In an analysis of the latest tradeshow trends, Competitive Edge—an exhibitor education, training and consulting firm—found that the biggest players are using interactive technologies like tablets, touchscreens and digital signing to provide more personalized in-booth experiences. For example, last year we built a display for Bulb that featured framed screens where the exhibitors could showcase their digital product live. We’ve said it before and we’ll say it again: Lighting is everything. Typically, tradeshow hall lighting is a lot like movie-theater bathroom lighting: everyone and everything looks bad. Luckily, there are ways to fix that. Sean Roberts, a global strategist in the event and tradeshow industry (and good friend of ours) says that in order to create an inviting booth, consider what you’d like to illuminate, and find the right kind of lighting to do the job. Lighted display cases can add accent or drama to your product, and lamps or floor lighting can create an inviting effect. Walk the floor before you set up shop. Most trade show and event organizers give you some say in your booth location. There are competing wisdoms out there, as some would recommend vying for a spot by a big vendor likely to draw a crowd, while others swear by a booth near the food court or facilities. Roberts suggests attending the show the year before to scope out the event set up, and take notes on where people are migrating to, what doors they’re entering, and what locations are drawing the most attention. According to Roberts, in large spaces like trade show halls or malls, people typically start by moving right, or towards something big and bold up front. The experts all agree: Except in the rarest of cases, booth traffic doesn’t happen by accident. As you prepare for your fall trade shows and events, consider which of these booth traffic-boosters will bring up your ROI and help you meet your marketing and sales goals for the year and beyond. Need help designing or building your tradeshow booth or display? Contact us for a free consultation. Small spaces pose a unique set of challenges when it comes to interior design and decoration, especially for those with collections of art, furniture and heirlooms they want to incorporate into their home. With home sizes trending smaller, it’s becoming more important for every interior designer, decorator, home staging company and new homeowner to learn how to dream big in smaller living areas. We spoke with Trinity Wilbourn of Trove Collective—a Fort Collins-based home staging and design company awarded Best of Houzz 2016 and 2017—to find out how they work their magic in spaces without much wiggle room. The following are some of Trinity’s best tips and tricks for transforming your small space. Start with the lighting. Bring in as much light as possible and find ways to bounce it around the room. White treatments hung 4-6 inches above and extended 10-12 inches beyond the width of the actual window will create the illusion that the window is larger and make the space feel more expansive. Hang a mirror across from your window to help reflect and emphasize the natural lighting, and have two to three lamps set up on side tables—like our modern cube tables—or accent pedestals to further dispel the shadows. Get creative with shapes and textures. Incorporating different textures and materials—like acrylic, wood, metal, etc.—into your design can help differentiate various objects and surfaces, transform light, and add complexity to a space. For example, if you have a lot of rectangular shapes in your space, consider a cylinder pedestal to break up the hard angles. Utilize the Rule of Three. Bring three objects of varying shapes, heights and colors into a grouping. The brain loves odd numbers and unusual pairings and tries to resolve it, keeping you engaged with the space. Try putting three objects of various heights together—like a book, a bowl and a vase of flowers—on a white display pedestal. These can easily be rotated out with changes in the season or personal taste. “Put a plant on it.” Plants offer a shape and texture that you simply don’t get with any other object, and they bring life to a room. They’re proven to be a powerful presence in any home and look stunning displayed on a wood or white plant stand pedestal. Be consistent with color. Choose a palette or a few main accent colors coupled with neutrals and repeat throughout the room. Trove Collective currently stages using a cooler palette of greys and blues. Add height-differentiation to your furniture. This adds depth and interest to the room. A pedestal or display stand can help break up sofa/coffee table lines, divide the room or fill an awkward-sized empty space. Have a small space solution we missed? Let us know and we’ll share them with our followers! The people lucky enough to attend the BottleRock music festival two weeks past were able to enjoy an ice-cold Heineken from a custom-built bar surround that looks so naturally Napa, they’d never guess it was built in Fort Collins, Colorado the week before. We fell into this project by way of Corso Agency, a lifestyle and cultural marketing agency whose work you may have seen at Coachella, The Pegasus World Cup Invitational and the US Open, among others. They work with some of the world’s largest brands to create unforgettable experiences. We love working with Corso, so when they came to us needing six bar surrounds in two weeks for their customer Heineken, we said “Absolutely” and got to work. Corso sent us a rendering which we used to build a 3D model. The model was approved within hours and the project hit the floor. We used polyurethane paint to get that perfect Heineken green. Just seeing it makes you thirsty. It’s collapsible for easy shipping and storage, made to withstand the outdoor fun, and can be set up in no time. The taller back pieces you see in the rendering are used to hide the pallets of beer and water for restocking the coolers and keeping the thirsty masses going. This ultra-portable, uber-flexible solution will allow Corso to extend Heineken’s branding throughout the U.S. this festival season. And we’re excited to premier another design soon for Corso, making appearances around the NYC area this Summer. Stay tuned! Working on a custom project for an event, festival or trade show? Let’s talk. Most days, we get calls from dozens of people needing a single pedestal. A few weeks ago, we got a call from one person who needed hundreds. We’ve had the pleasure and joy of working with Ugg (you know, the footwear company famous for these boots) on retail displays over the last few years, but this order of theirs was a little different. They needed 360 clear acrylic pedestals and risers for their big spring sales event—the launch of their upcoming seasonal line—to which they invite all of their distributors, customers and friends. Acrylic pedestals—made out of the same material as plexiglass—are one of our top sellers. Elegant, modern, and a lot more durable than they look, our acrylic pedestals are fully customizable, available in several colors with various lighting options. The clear option Ugg ordered has an airy, open look that gives your product or art piece a feel of floating. On the production side, making 360 pedestals is almost the same as making a single unit, though with an order this size the name of the game is: Logistics. As a lean manufacturing company, we make everything to order, so the first step was confirming we could source the materials in time to meet a tight timeline. With so many customers in the trade show or event space, we don’t mess around when it comes to deadlines—we meet them, or we go extinct… so we always meet them. One of our disciplines to keep on track is The Pre-mortem: a group huddle to anticipate potential issues with a project before we start cutting and to establish daily production benchmarks, ensuring there are no surprises. We also work on a one-piece flow, building one piece from start to finish instead of working in large batches. If there’s a defect somewhere along the line, we catch it on the first pedestal, stop production, and fix the problem in real time on Pedestal No. 1 rather than on No. 360. Have a custom job for your retail space, event or trade show? Let’s talk! 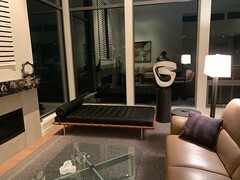 Our acrylic pedestals (like the ones that Ugg ordered) are elegant, modern and fully customizable. Order yours today.